A female at Ponta do Pargo on 1st May 2008. In all there was four birds (2 females and 2 males) at the site. Photo: Thijs Valkenburg, Netherlands. One of the females at Ponta do Pargo on 2nd May 2008. 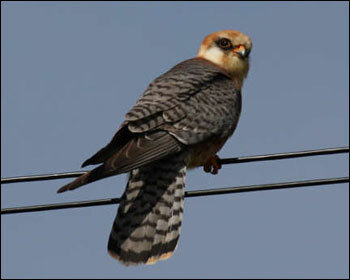 There are three unconfirmed records of Red-footed Falcon in Madeira and this is the (fourth) only documented one. This female was present at the western tip Ponta do Pargo on 16th June 2003. Photos: John Jackson, UK. 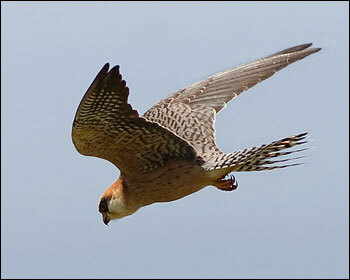 Here a short story by John: "The Red-footed Falcon was a great bird, but I did not find it. An English birder told me it was there about a week before I saw it. 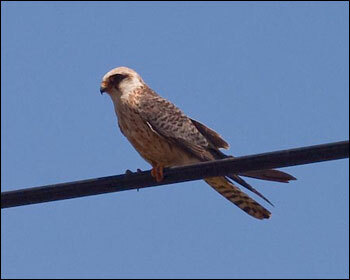 At the time I assumed he had mistaken a local reddish-coloured Kestrel for a Red-foot, so when I visited Ponta do Pargo I was amazed to see it there on the wires near the lighthouse. It gave very good views, and even came on to the road about 5m in front of me to pick up grasshoppers that I scared out of the grass! I think it stayed for some time. 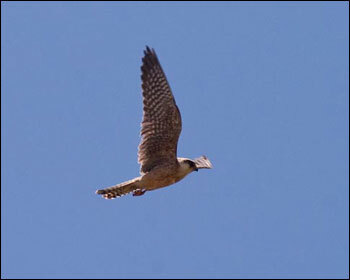 The local birders seemed to know of it already and I think it is already documented."